This collection consists of material regarding the United Nations (UN) Convention on the Law of the Non-Navigational Uses of International Watercourses, adopted by the General Assembly on May 21, 1997. It is the only treaty governing shared fresh water resources, and emphasizes conservation of those resources. Sixteen nations have ratified the treaty. 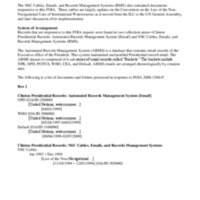 The files in this collection contain electronic records regarding the development and implementation of the agreement.